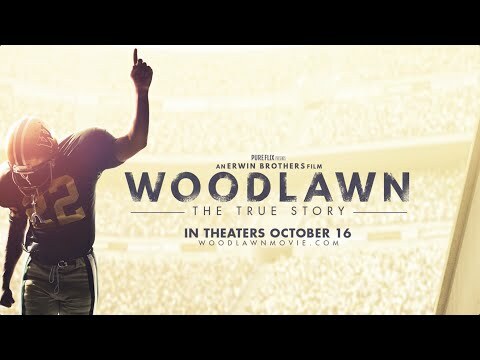 We got to see a pre-release screening of Woodlawn and it's outstanding AND completely uncompromising. John 14:6 is at the top of their posters: "Jesus said to him, 'I am the way, and the truth, and the life. No one comes to the Father except through me.'" It tells the story of a revival that broke out in Woodlawn High School, Birmingham, Alabama, during the race riots of the '70s. A Fellowship of Christian Athletes chaplain, who happens to be the filmmakers' father, played by Sean Astin (Lord of the Rings, Mom's Night Out), asks for five minutes with the team, and miraculous results follow! It's an outstanding work of art that doesn't compromise its Christian message. The filmmakers had 400 clergy members give feedback to make certain it's a God-honoring production. After the screening we watched, Caleb Castille, the lead, shared how he was rejected after his audition, but he went to the "football audition" and was cast as the lead's body double. Three days before they started shooting the British actor who was cast as the lead had unsolvable visa issues. They brought Caleb in to have him re-audition. He had taken his body double role seriously and had been reading through his lines every day to become the character. He nailed the audition and is now in almost every scene of the film. Caleb talked about how he's walked away from projects that promote a secular worldview. He said that one way he's stayed centered is to remind himself that Jesus is the most popular person to him, and Jesus' desires for him are the most popular concepts for his thought life and actions. In the theatre lobby off of Union Square, NYC, in front of the giant poster featuring him pointing to heaven, indicating there's only One Way to get there, several of us laid hands on him and prayed that the Lord would use this role strategically and keep him solid in his faith and uncompromising in his convictions. His thesis is proved by the fact that War Room became the NUMBER ONE FILM IN AMERICA! 1. We want our worldview to be represented. 2. We don't want to be offended. 3. We want to be entertained. We sacrifice the first two for the third. Now that more and more Christian-made films are rolling out we don't have to do that anymore! For a list of films I recommend click here. 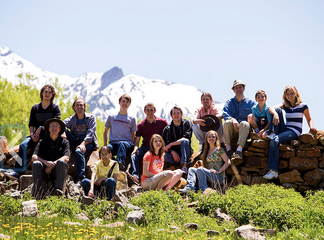 Sign Up to get the announcement when registration opens for the 2016 Rocky Mountain Christian Filmmakers Camp. Also, we're now taking sign-ups for Rio Ready.